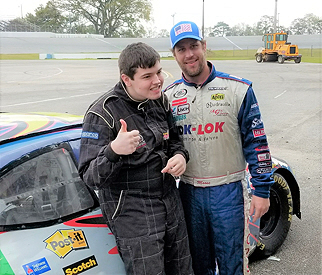 With a weekend off from the ARCA schedule, Thomas “Moose” Praytor was able to surprise one of his biggest fans, Reese McGahagin, with the duo turning a few laps with the Rusty Wallace Racing Experience. After Talladega, Praytor kept going in circles while McGahagin was running his own races, taking home medals in Special Olympics competition. The pair kept up with each other’s exploits and with the Rusty Wallace Racing Experience coming to Mobile, the wheels started turning. Reese’s Dad got Reese approved to take part in the ride-a-long and the Moose jumped in to give Reese a surprise driver, while Fox 10 agreed to get it all on tape. With everything in place, the group assembled to take Reese for a ride. They say a picture is worth a thousand words, Reese’s smile says it all.